Hi everyone, things are really coming along in the house. Hanging the curtains is next. Since we had to leave all our rods at the old house I’m purchasing new rods now and then things will start getting hung. I figure, when I am finished, it won’t be that long until I have to start decorating for fall, LOL. I wanted to share with you the area we built especially for Peanut, Reeses and Momma. This is the best money we have spent thus far. Let me introduce you to the puppy run. It is filled with 20 tons of stone and faux grass. This way no more destroying the lawn and momma doesn’t have to take them on a leash anymore to do their business…just open the kitchen door and Viola! All fenced in safe and sound. Reeses, I knew, was going to be my outdoor pup. He loves it and wants to be out there every minute. They have discovered they love following dragonflies, watching bumble bees and flies zooming around their heads. Daddy has even purchased them balls to play with and chase after. The grass is truly amazing, it looks and feels like the real thing. Momma has the enjoyment of picking up their poop again too. With the brace I am able to walk around and play with them and scoop the poop. Their cousins Bend and Sprout came to visit and they love it too. The four of them were anxiously waiting for the door to open so they would be able to play. This shot of Reeses was taken when he wanted to go outside and play and momma said it was time for her to finish decorating the bookcase. He wasn’t very happy. Ha ha too cute. I love the dog run you made for Reeses and Peanut. I bet they are adjusting and loving the new house. Your dauchs remind me so much of my daughters little Penny. She is ginger colored and has those same looks on her face. They are the sweetest little pups ever. Everything is looking so great. I bet if feels so good to have your own home again. It feels fantastic, and the decorating has been fun. What a fabulous idea! You remind me of us with your fur babies! 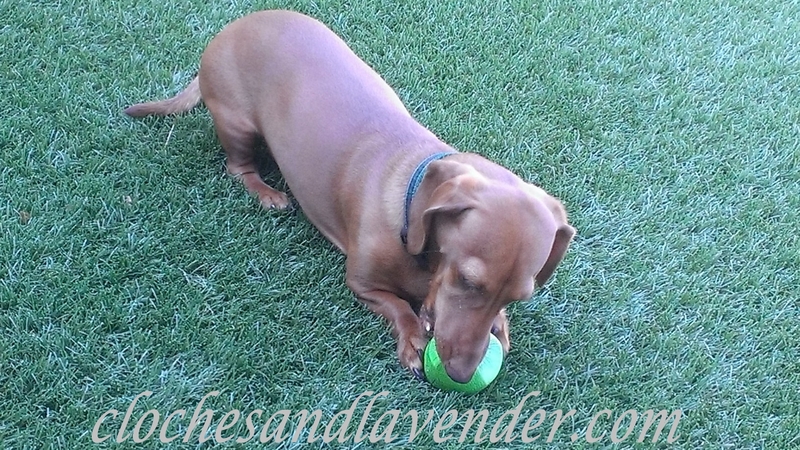 I love the dog run and I know it’s perfect for you! They seem to really love it! What a peace of mind to know you can let them out and they’ll be safe. I can’t wait to see your new home! I know you are having fun decorating it! I am having a blast and it gets there everyday. I’m hanging curtains now and waiting for some to ship. omigosh – look at them all!! What a great idea to use fake lawn for a dog run. Brilliant!! That Max is a character!! Donna totally worth every penny!!! Love the photos of the dogs. That run is just what I need! Do you hose it down? You don’t have to but can. I just scoop the poop and the urine drains through the stone underneath. If it didn’t rain for weeks we would hose it down just because but no odder at all. 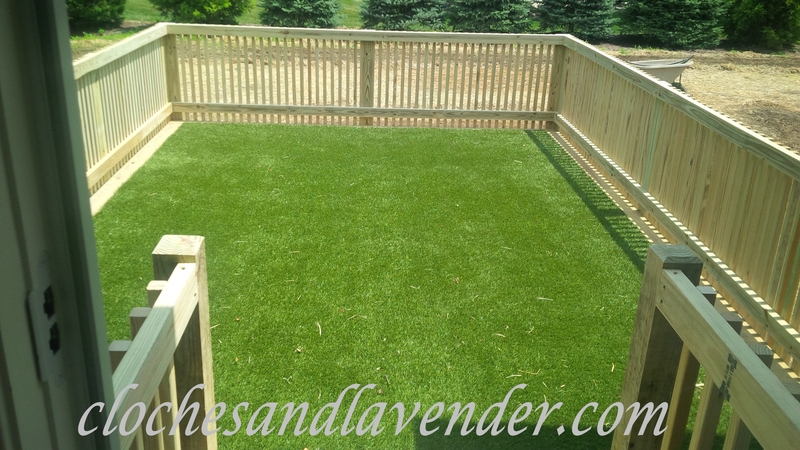 Great area for the puppies – they all love to play and play. They are so cute. I love the picture of the all the pups at the door waiting to go out. So cute! What a awesome addition…your pups are too cute!! Great idea!! 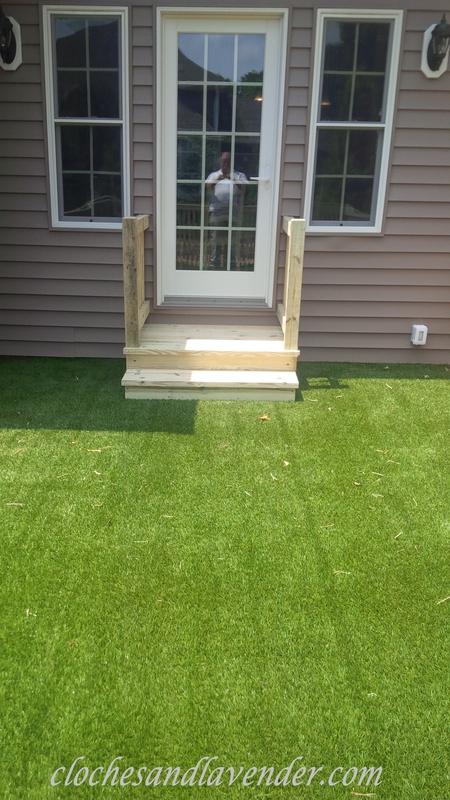 My pup likes to “go” just at the end of the patio, so all the grass there is ruined. Maybe I should make a little dog run for Jesse too. I have to tell you Heather this is the best money we ever spent!! The dogs love it and it is so easy to take them out. It is perfect for our tiny ones that don’t need tons of running and need to be kept safe from predators. great space for the pups! love the last pic! 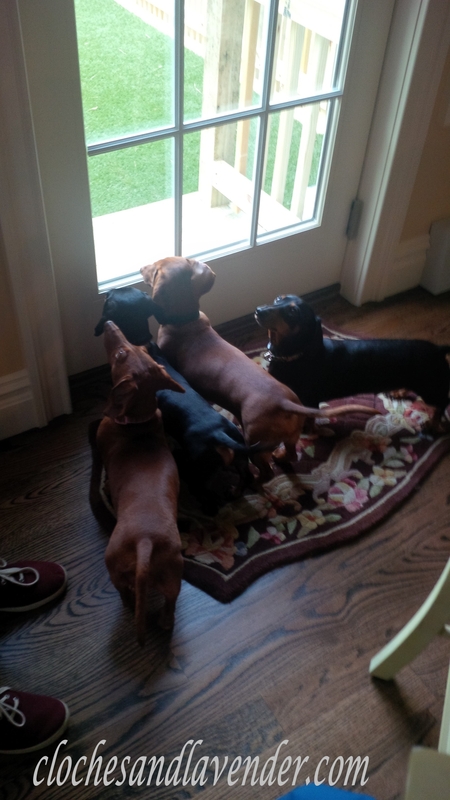 Love the picture of the four dogs waiting to go out and romp. They are adorable, Cindy! That grass looks so real in the pictures. I guess it is probably better to have faux around for the dogs. No turning yellow or otherwise looking bad. Our yard in the old house was horrible. This works out great and they love going out there all the time. What a great space! I can tell that the pups love it! It looks as if you are settling in quite nicely! Thanks Shenita, I can’t wait to start showing the house. Getting there but still have curtains to hang. It is going much faster then we thought. What a great idea! 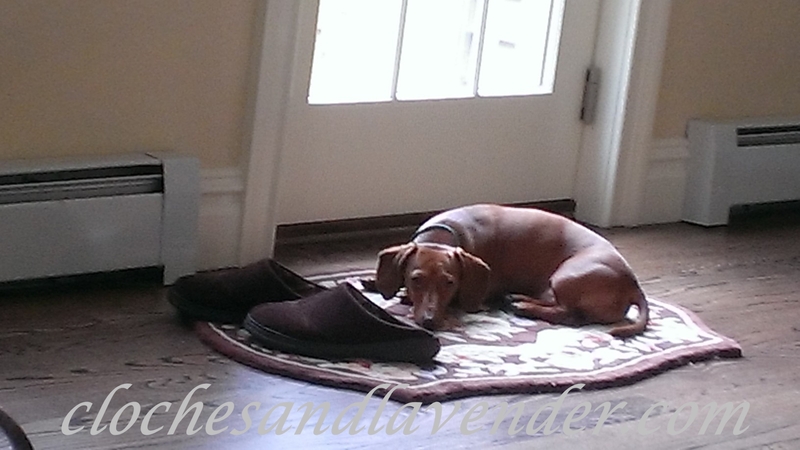 They look sooooo cute waiting by the door…..such cutie patooties!!!!!! My mom used to use the word patootie! They are gorgeous and as she would have said, my cutie patooties. Hi Carol, it is amazing how this looks. Perfect for them. What a great idea! The pups are so cute too! Can’t wait to see the rest of the house! Thanks Cindy, can’t wait to show the house. Things are really getting finished. Not only did you get a beautiful home, the pups got one too (outdoor living)…they look so very happy and I am sure mom and dad are too! !…Beautiful space!! Thanks Shirley, we all love it and since they are tiny it gives them room to run and play. What an adorable post! 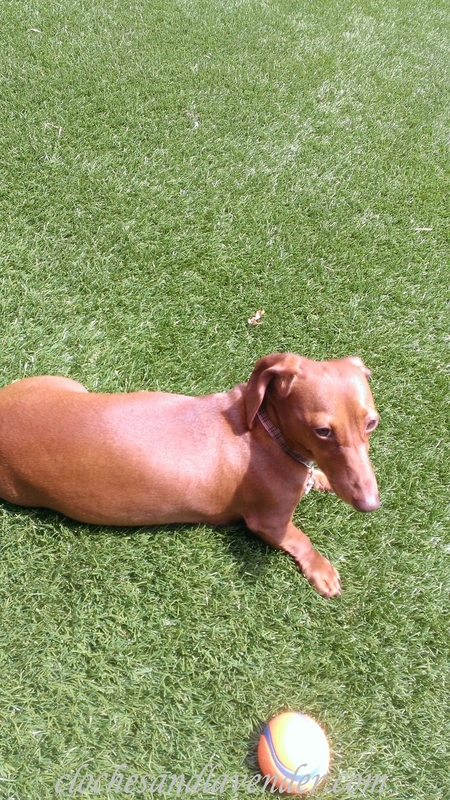 I love the dog run and that artificial grass looks amazing! Things are getting pretty around here and it has been fun. The pus love it out there and it is great for me. Wow Cynthia!! That dog run is amazing!! It was a labor of love, and it shows! It’s perfect, and I’m sure your fur babies love it. You just can’t put a price tag on piece of mind. Without a doubt the best money we spent. They have so much fun those two little loves and perfect for me. Well with 4 doggies, I don’t blame you for making a dog run! That’s a great idea. My youngest son would love it if we had that since he’s always worrying about our dog every time he goes out. He watches him like a hawk! They are so cute! I love dogs! 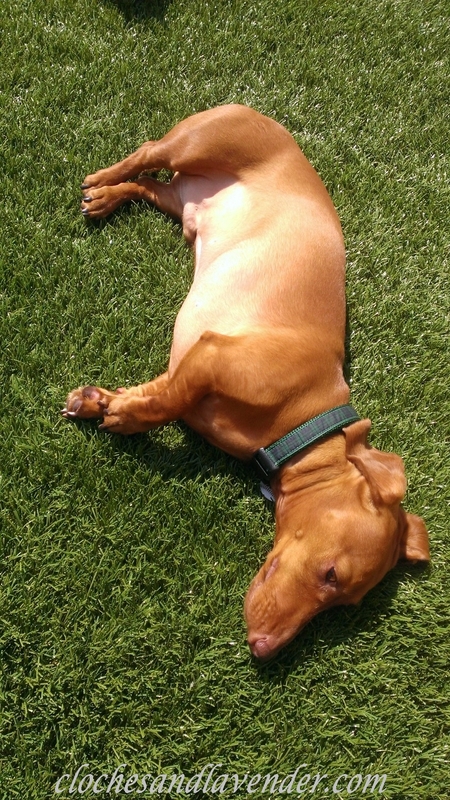 That dog run is incredible – that grass looks so real! I know you’re happy your puppies have a safe outdoor space they can enjoy! This is SUCH a great idea! I can see why both you and the pups love this outdoor space. I must say I think our pups are adorable!